Vincenzo Claudio Spagnolo (“Spagna”) R.I.P. After a fantastic second half Genoa draw against the stars of A.C. Milan: 1-1. In the first half David Beckham scored the opening-goal with a great free-kick, while Andrea Pirlo of Milan hit the crossbar twice with a free-kick. In the 2nd half Genoa was surely the best team in the field. In the 81st minute goalkeeper Abbiati saved a great header of Milito, but 6 minutes later Diego let Abbiati no chance: 1-1. 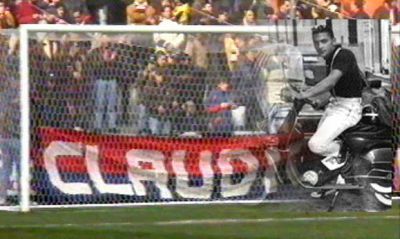 In the 92nd Milito ran towards Abbiati to score also the winning-goal, but Maldini kicked him from the back. Referee Gervasoni saved Maldini to show him only a yellow card and Jankovic could not realizee the free-kick, so the matched ended in 1-1. A fantastic result, which keeps us on the 4th Champions League position in the standings. The big match of the 21st playround of Serie A tomorrow is between nr. 3 A.C. Milan and nr. 4 Genoa. The difference between the 2 teams is only 4 points and 2 goals. The first match this season between the 2 teams ended in a victory of Genoa by 2-0 with goals of Sculli and Milito. Since this match Milan played 9 homematches and did win them all, while Genoa took the last 3 away-matches the 3 points home. Genoa misses probably only 3 players tomorrow in San Siro: the long time injured Matteo Paro + Andrea Gasbarroni and the 1 match banned Matteo Ferrari because of his red card against Catania. The Gasperini-boys also miss the support of the Genoa-fans, who are not welcome in San Siro because of the problems between the fans of both teams since the killing of Genoa-supporter Claudio Spagnolo by Milan-fans in 1995. The words of Mr. Gasperini were very simple: Diego Milito is not a player you put on the bench, if he is healthy he has to play always, so also against Catania. The biggest problem was to substitute banned Ivan Juric, the player who recovers many, many times the ball of the opponent. Mr. Gasperini put Milanetto besides Thiago Motta but of course Omar is a completely different player as Ivan, which we saw in the 1st half when Catania was the best team in the field till the last minutes before halftime when Bocchetti hit the crossbar and Milito just missed the goal by centimeters. 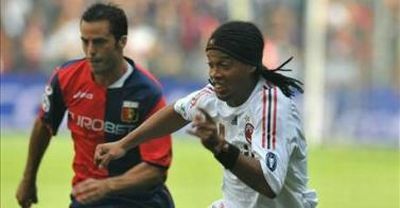 In the 2nd half Genoa started as the best team and the Gasperini-boys also opened the score, but the goal of Milito was annulated because of off-side of Jankovic. A few minutes later the match completely changed with the second yellow, so red card of Matteo Ferrari. At the moment Martinez also gave Catania the lead everybody feared the match was over, but we have Diego. Within 5 minutes he scored the equalizer: 1-1 and till the end of the match he was the nightmare of the Sicilian defenders. Unfortunately he did not score anymore, so the match ended by 1-1, but we stay 4th in the standings. Genoa wins also in Lecce 0-2; now 4th !! Today the 3rd away victory in a row without taking a goal: Sampdoria 0-1, Chievo 0-1 and today Lecce 0-2. 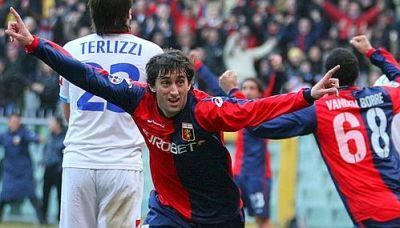 Inside Luigi Ferraris Genoa wins almost always since the start of the season, but till the derby outside Marassi we could not win. Since the great goal of Milito at 7th December everything has changed and now we win outside as easy as at home. In Lecce we again missed Diego Milito who probably returns next week against Catania. As a surprise Gasperini started today with only 2 strikers: Olivera and Jankovic. In the first half Mesto missed a big chance alone in front of the goalkeeper, but halfway the 2nd half Jankovic scored a great goal with a back-kick. After this goal Lecce had to play more offensively which gave Genoa more space in offensive actions. Marco Rossi first failed eye in eye with the goalkeeper of Lecce while substitute Vanden Borre was completely free besides him. In extra-time substitute Giuseppe Sculli finally doubled the score by shooting the assist of Juric in the empty goal: 0-2. Genoa now is halfway the season 4th in the standings with 35 points, 10 more than last year after 19 matches. Besides the 16 regular players, including the recovered Thiago Motta, Mr. Gasperini also selected the youngsters Lamanna, Signorini (son of the famous captain of Genoa in the past) and El Shaarawy. Unless the distance of 1090 kilometers 250 Genoa-fans will be present in Lecce in Stadio “Via del Mare”. Everybody thought in the 19th minute when Biava received a red card and Inter got an undeserved penalty after the fall of Adriano outside the penaltyarea that the match was over. But Alessio Scarpi stopped the penalty and the 10 Genoani fought like lions to stop the offensive actions of Inter. In the 75th minute Adriano scored the opening goal and again the match seemed over, but Marco Rossi scored with a fantastic shot the 1-1 equalizer only 4 minutes later, which was also the score after the regular 90 minutes. In the extra 30 minutes it was Zlatan Ibrahimovic who decided the match with an assist and a goal: 3-1, but what should be the result if referee Gava whistled an honest match and send also Muntari off the field when he deserved it…..